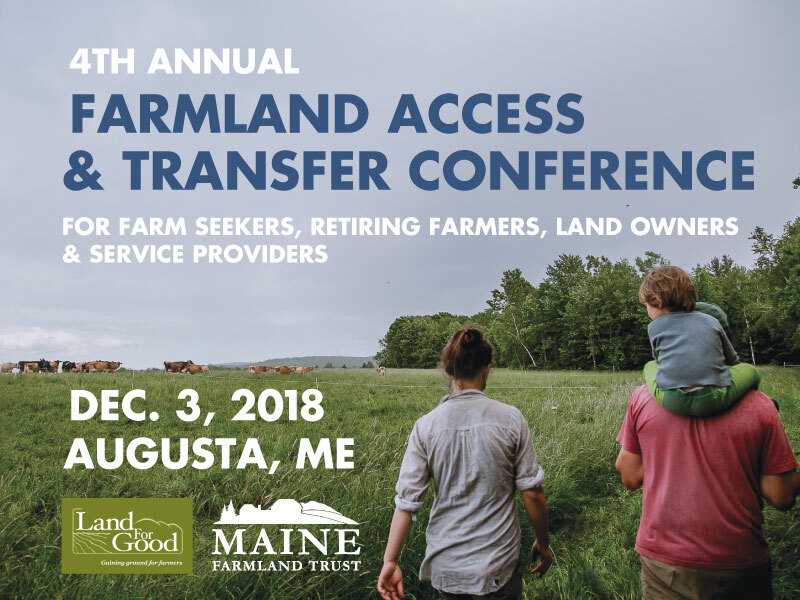 MFT and Land For Good will host the fourth annual Farmland Access & Transfer Conference on December 3, 2018 at the Augusta Civic Center in Augusta ME. At the day-long conference, farmers will learn strategies for tackling succession planning and incorporating an easement into your farm access or transfer plans, plus how to find and secure farmland of your own, negotiate a good lease agreement, and more. Today’s farmers—both those who are transitioning out of farming and those who are starting new farm enterprises—will have a pivotal role in shaping the future of our regional food system. Farmers can also make valuable connections at this conference. Last year, the conference brought together over 150 established and beginning farmers, landowners, and agricultural service providers. The deadline to register is November 28, 2018. Cost of attendance is $20 per person and includes a lunch sourced from local farmers and producers. For more information or to register, go to visit the event page.